Before being able to adjust your bassoon reeds you must first decide what is wrong with the reed, it is no use simply saying the reed is 'bad'. Some issues you may find with reeds can include: finding it hard to tongue fast, low or you may find high register is hard to play, the reed is too 'dark', the reed can't play soft enough, it has a sharp low register, etc. You then need to try and solve these issues one at a time! The main efforts of a reed maker go into 'balancing' the reed. Balancing the reed means that the reed is symmetrical on either side of the spine and on both sides of the blade, this allows the reed to vibrate at its best. The important point to take away from this is that if you scrape one area of the bassoon reed you must scrape that area on the other side of the spine and on the other side of the reed blade. However, if one area looks thicker than the same area on the other side of the reed blade you need to made them the same by taking some cane off from the thicker area. 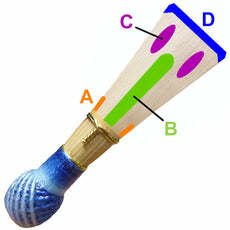 For more info about balancing bassoon reeds visit our *NEW* Bassoon Reed Balancing Guide! Before any adjusting soak the reed for a minute or so to avoid the reed splitting. This wire should, as a starting point be loose enough that you can see it move slightly when you press your finger nail against it but not so loose that you can easily move the wire up and down the reed shaft. This wire should be tight so that it cannot be moved. Improves stability of E and C# (below middle C) . Never touch this when adjusting reeds (in most cases you can't see this wire as it is under the thread wrapping at the bottom of the reed). Learning how to scrape bassoon reeds can be a long process as much of how you learn will be based on trial & error. You can either use a file or a knife which must be kept very sharp using a sharpening stone for scraping the reed. When scraping the reed insert a bassoon plaque to support the reed and your knife / file. When scraping bassoon reeds only take a minute amount of cane off at a time and then try playing the reed before doing more editing. This is important as once you have scraped the reed you cannot reverse what you have done! 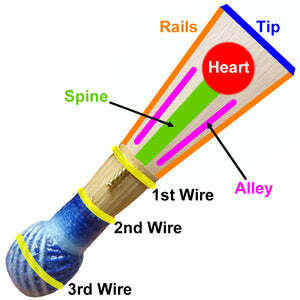 Below are some very generalized areas of the reed in which you can scrape to hopefully achieve the desired effect. The following points are very generalized as each reed is very different to the one before due to factors including the density of cane, when the cane was picked, direction of the grain, etc... and so how you scrape each reed and how it reacts will vary. 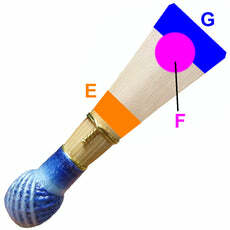 When played loudly the reed doesn't play E or C# in the stave in tune. The E and / or C# dip flatter. After making sure the reed is balanced (see above) and the 2nd wire is tight clip off a very, very small amount of the tip of the reed off at a time. Then try the reed playing those two notes very loudly, continuing to clip until you no longer have a flat & unstable E.
This guide is not meant to be a strict guide in which you follow every point exactly, it merely provides a starting point and some guidance to help you learn where & how to adjust bassoon reeds. So, have fun and experiment!